25.A.3e Visual Arts: Analyze how the elements and principles can be organized to convey meaning through a variety of media and technology. 27.A.3b Compare and contrast how the arts function in ceremony, technology, politics, communication and entertainment. Students will learn about radial designs from around the world. Students will learn that art can be found in other cultures and periods in time. Students will learn how to make a template grid that will inspire a radial design. Students will learn that the arts can communicate. 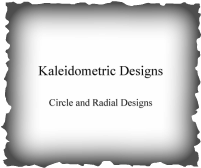 Students will make a radial design. 1. View mandelas from around the world. 2. Demonstrate how to make a grid template. 3. Students will make a grid and create a circular design from the template. 4. Students will use color in their design.